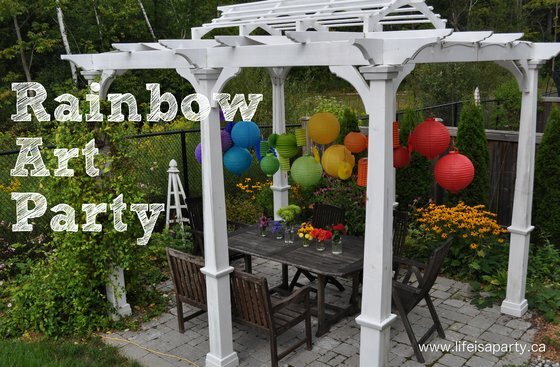 Rainbow Art Party Decorations: Rainbow paper lanterns, rainbow candles, a rainbow cake of art supplies and a paint chip birthday banner are just some of the fun ideas! Last week my oldest daughter, Paige, turned nine. Nine, as in almost ten…where does the time go? 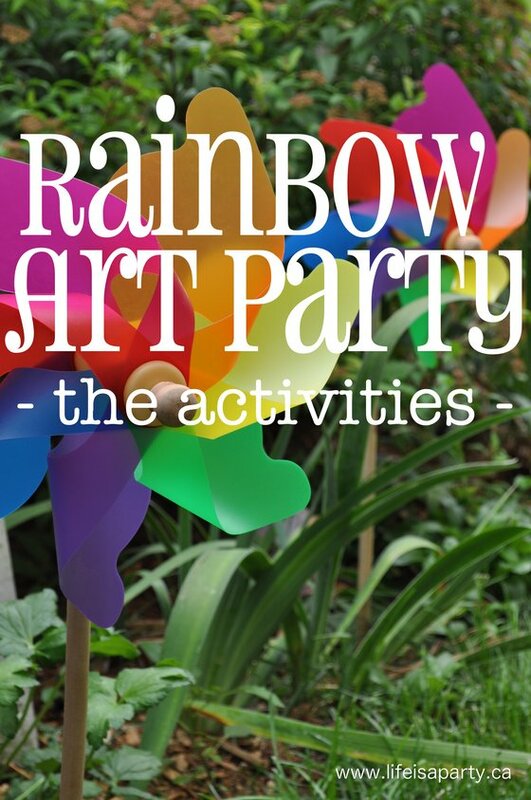 She wanted a Rainbow Art Party, and today we’re sharing all the fun Rainbow Art Party Decorations. I did a little photo shoot with her one day to make our cute party invitations. Then I just printed them on the computer. She really loved them. I thought I’d start out by sharing all the pretty decorations with you. (Stay tuned later in the week for the activities and the food!) 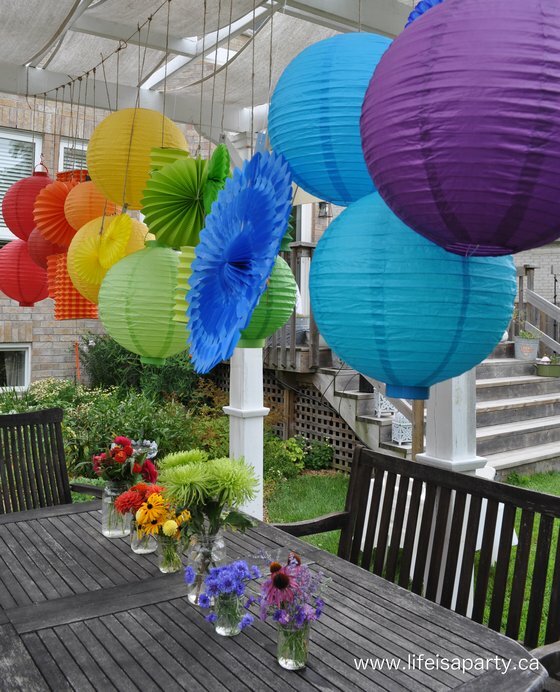 My very, very, very favourite decorations were the rainbow paper lanterns and rainbow flowers. 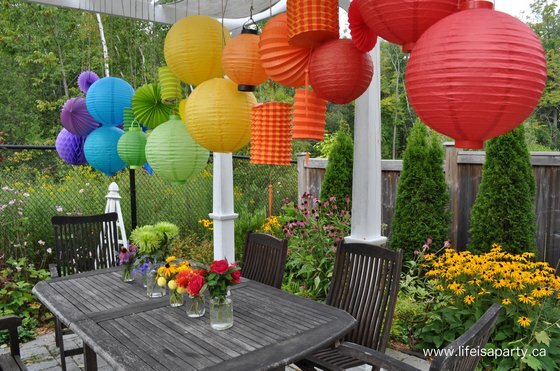 I collected paper lanterns from all over in all shapes and sizes for weeks and weeks. We hung them all in a line, in traditional rainbow order. They looked so, so pretty hanging on our pergola. 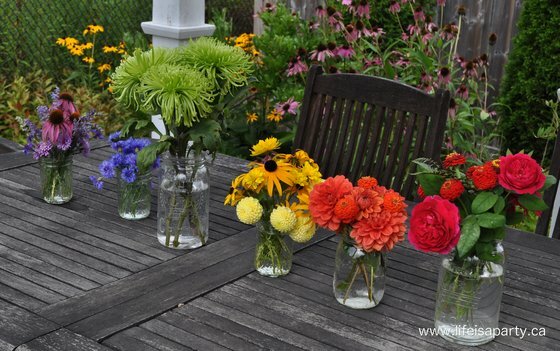 I always love to do special flowers for a party, and came up with the idea of doing one pretty mason jar for each colour of the rainbow and lining them up in the same rainbow order. All the flowers are pretty much from my mom’s garden, with the exception of the green mums that I picked up at the store. I love how it turned out. 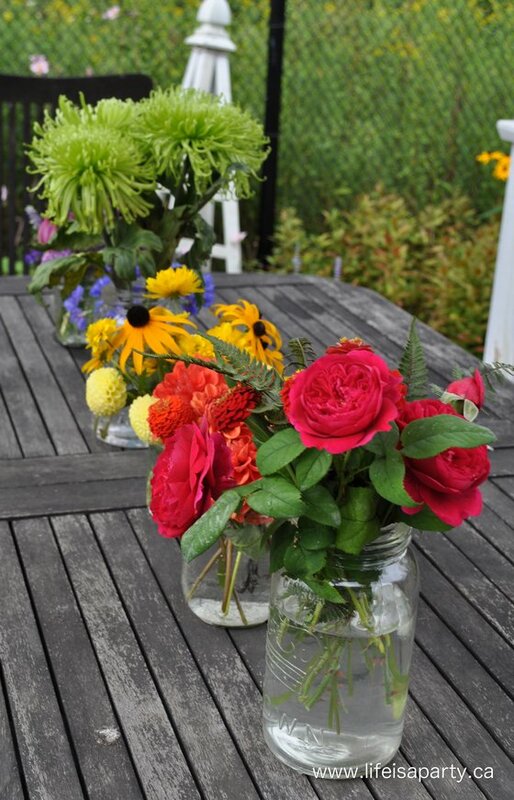 Using different sized mason jars as vases was the perfect way to accommodate flowers of all different sizes. 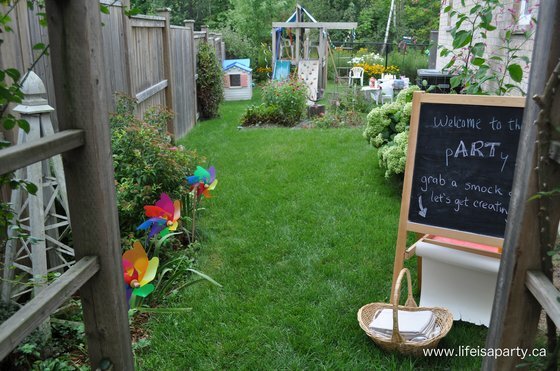 We planned to have the art activities outside in the yard when guests first arrived at the party, and then move into the house where it was cooler for the food. 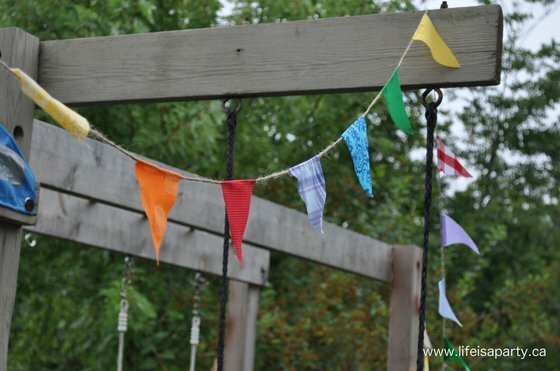 I wanted to add a little rainbow to the play structure so we made a simple rainbow bunting. We planned to welcome guests through the side gate, and into the yard. 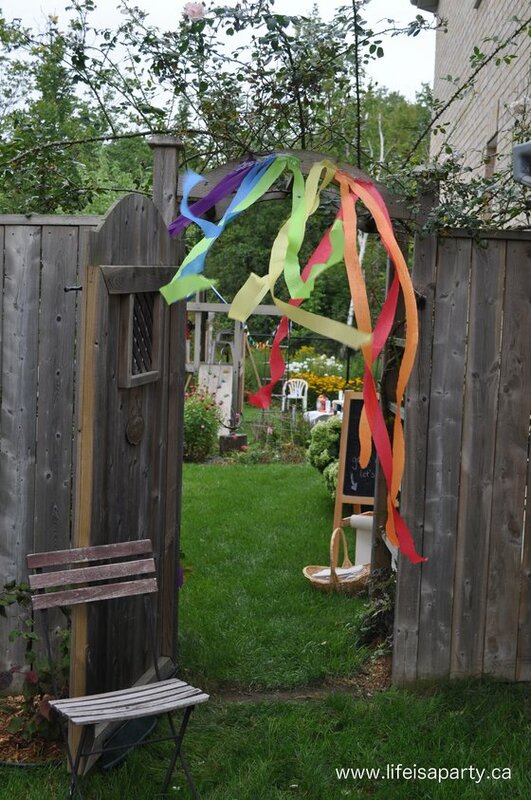 I decorated the rose arbour with simple rainbow streamers. They looked so pretty blowing in the wind. 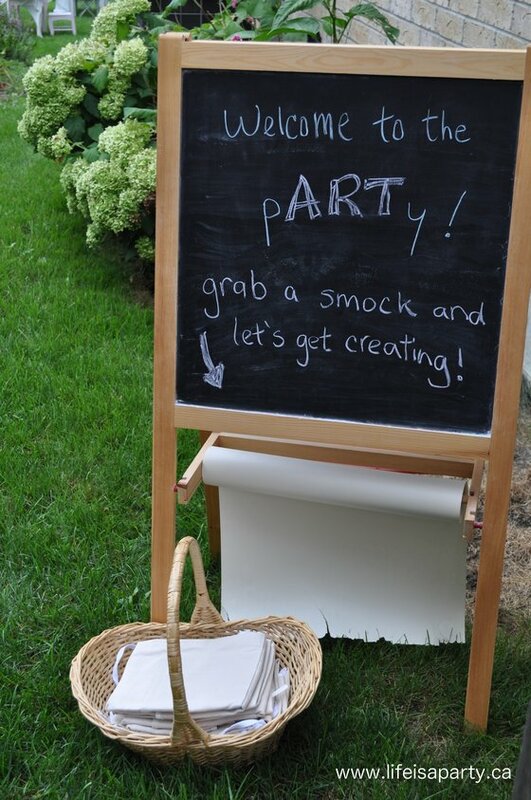 Guests were welcomed by the chalkboard, and a basket of art smocks for our little guests. 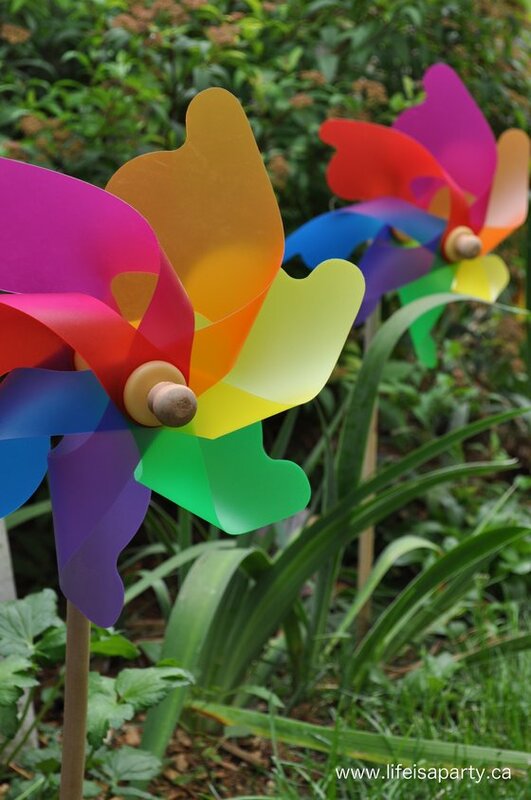 I added these giant rainbow pinwheels to the garden edge. Inside, there was a pretty rainbow decorated mantel. During the photo shoot for the invitation we got lots of fun shots of the birthday girl with a bouquet of rainbow balloons. For the mantel I printed a few and put them in simple dollar store frames. 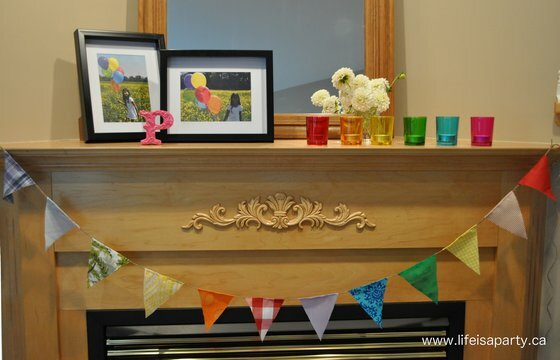 We made more rainbow bunting and added in some pretty rainbow candles. In the kitchen, we didn’t have too much room for decorations. We decorated the chalkboard and I made a fun art birthday cake (think diaper cake but way better) as a centre piece. I used mini hat boxes as the base, and held art supplies in place with elastics, ribbon and a little tape. 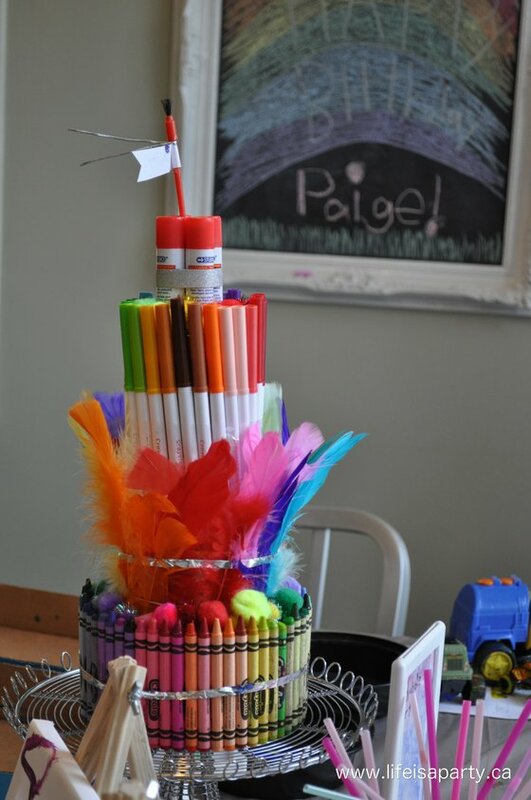 We layered crayons, pom poms, feathers, markers, and glue sticks, with a paint brush flag. It made for a fun addition. 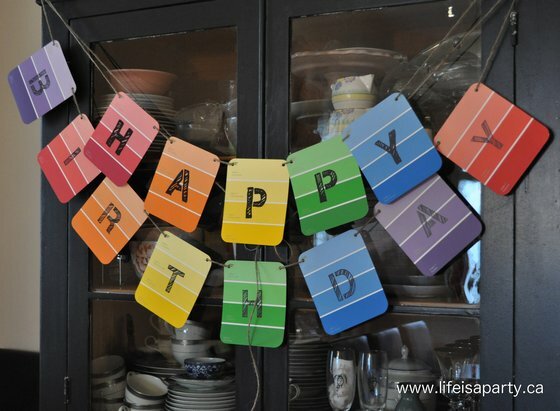 In the dining room, I made this great birthday banner. I used free paint chips from the paint store, a letter stencil, and a black sharpie. It was so easy and turned out so cute. 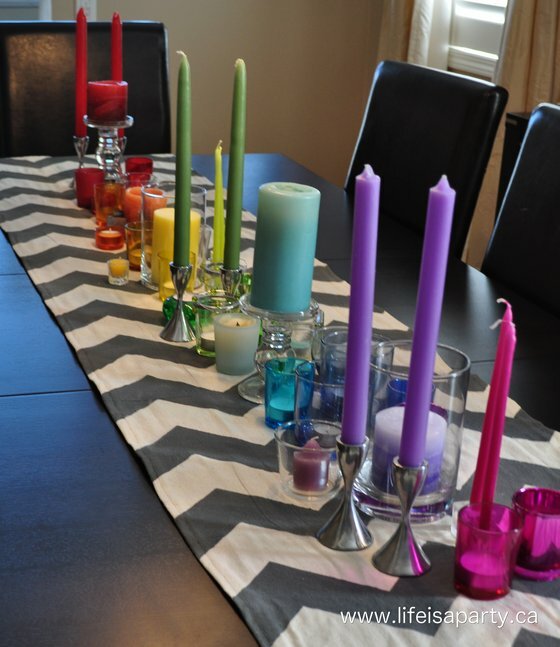 On the dining room table was my second favourite decoration, a rainbow of candles. I came up with the idea and wanted to start shopping but forced myself to check my candle stash before I bought anything. I had them all, with the exception of two pairs of tamper candles. Guess I should do a candle inventory more often. I love how pretty they looked all together. 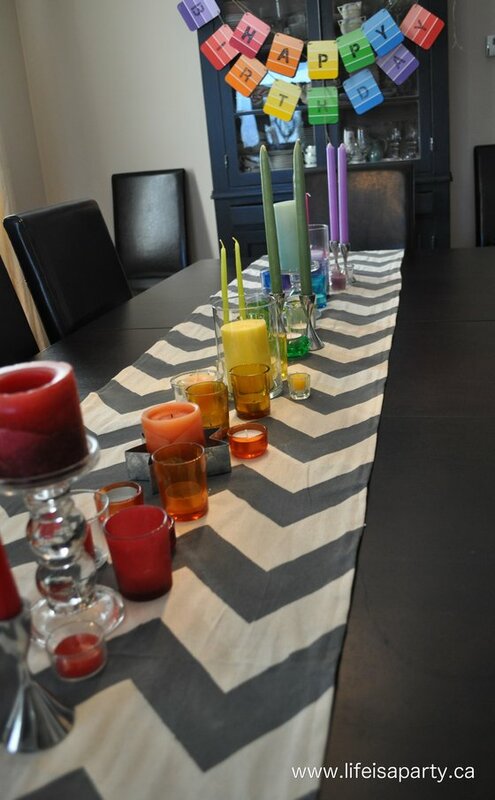 I tried to keep it somewhat uniform by only using glass and a few metal candle holders. One of the other best decorations -our guests! We asked the guests to all wear denim on the bottom and a certain coloured shirt on top all with the plan of taking a fun group shot. Love how it turned out. And you can see the birthday girl in her party outfit, white with a rainbow tutu -so much fun! It was a great party…despite the rain. That’s right it poured. The party started at 11, and by 10:30 we were pretty much set up for me to take pictures and add just a few more details. At 10:50 it started to rain -hard. We scrambled to get everything inside, including all the pretty paper lanterns before they were ruined. We forgot the paint smocks, but my mom quickly threw them in the dryer for a few minutes. 😉 As our guests were coming through the door, we were drying off the things from all of the 7 art centres we had originally set up in the backyard (more on the activities on Wed.). Everything was thrown in the patio doors dripping wet while running around like chickens with our heads cut off when it started to pour. But parties aren’t about everything being perfect, they’re about having fun together. 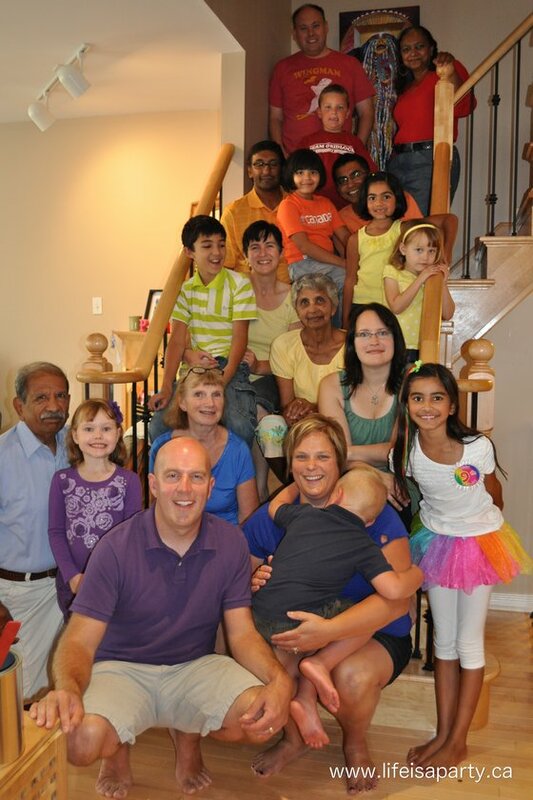 So our guests pitched in and we set everything up inside and had a great time -I love our friends and family. I was most sad about the lanterns that had nowhere to go inside and ended up in my bedroom, slightly damp but out of the way to be dealt with later. We all joked that everyone could see how pretty they were on the blog -so there we have it, at least we had some pictures before the rain came! And I must say that the birthday girl didn’t seemed that bothered by the rain (that interrupted her party for the third year in a row -next year an indoor party) and just had a great time enjoying her favourite pastime, art, with all her favourite people! Proving that life is what we make it, so we may as well make it a party -even in the rain! 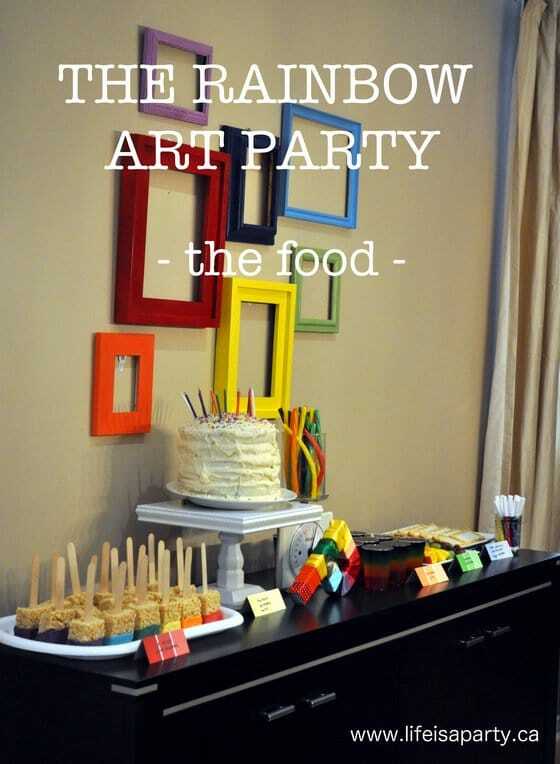 and The Rainbow Art Party Food here. This is pintrest worthy! What an AMAZING party! Sorry to hear the weather didn’t co-operate, but mama – up top for a high five! Unbelievable attention to detail…lucky 9 year old! 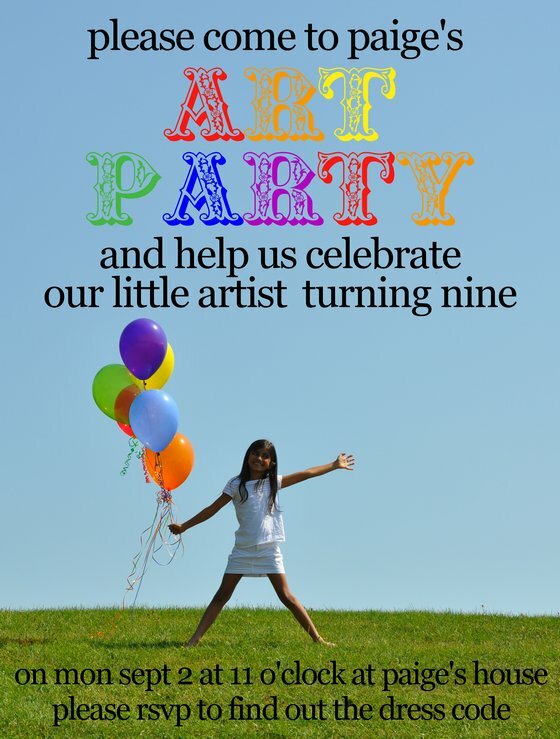 I’m also a savvy mama…found ya on the site – you should be a party planner! I love it! My favorite part is the smock basket! What a cute idea! So cute! I love this idea. So bright and colorful! Adorable. Can I ask where you got the smocks? Hi Onna, the smocks are from Dollarama. Hope this helps.